Can Dogs Eat ... ? Which herbs are safe and which are toxic. Can dogs eat cayenne pepper, dill, chia seeds, coriander, fennel, ginger, oreganum, parsley, rosemary, thyme, turmeric, basil, mint, cinnamon? Yes. Apart from adding flavour and interest to your cat or dog’s diet, these herbs can be very beneficial to your pet’s health. For example, dill has anti-flatulence effects as well as having a positive effect on respiratory problems. 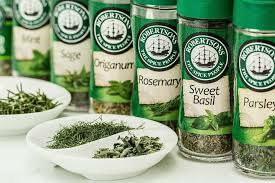 Rosemary is an anti-oxidant and Chia seeds contain a near perfect ratio of Omega oils. Can dogs eat comfrey, pennyroyal? No. Comfrey contains alkaloids that could cause cancer. Even though dried comfrey contains far fewer of these than fresh, I still feel that comfrey is best avoided. For more information on comfrey, click here. Pennyroyal can be toxic, especially in pets with kidney problems or who are pregnant. Yet, very high doses of garlic given over a long period of time can cause Heinz bodies to form on the surface of red blood cells. When these are destroyed,it can result in Haemolytic Anaemia. But, in small doses, garlic helps to regulate blood sugar, acts as a natural flea repellent and is an effective natural antibiotic. In conclusion, garlic can be toxic, but in small doses is very valuable and should therefore be used sparingly where possible. For more on garlic, read this. My dog got into pink stork fertility tea! Is It toxic to dogs?!?!? Charleen, although none of these are toxic specifically, if I were you, I’d get the dog to the vet. Especially if he ate quite a bit. I use lots of herbs in cooking and I like to give my dog the leftovers this article was very helpful in knowing what was safe! Thanks! Currently have my soul Beezer is in intestinal distress. I am ECSTATIC to add ginger and coconut to my pumpkin so we can all have comforting and good soup to make him better. Brilliant newsletter – so interesting. I don’t have a dog but read it right through!